Yes, competitive jigsaw puzzling is a thing. And it's the thing soft-spoken Agnes (Kelly Macdonald) discovers she excels at, emerging from her shell in the process. Rating: 3 stars out of 4. 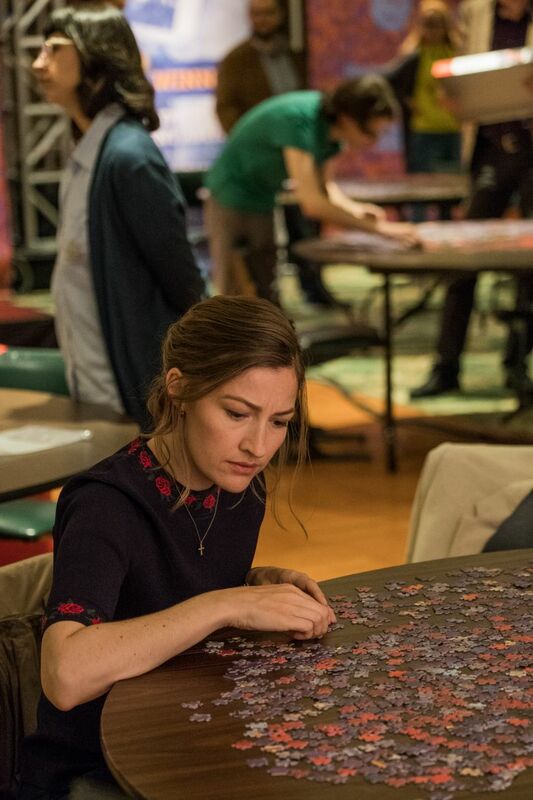 In the opening scenes of the gentle drama “Puzzle,” we see Agnes (Kelly Macdonald), a soft-spoken New Jersey wife and mother, preparing her home for a party: quietly and industriously vacuuming, setting up extra chairs, arranging snacks. (Only the modern vacuum tips us off that we’re in the present day; the midcentury look of the house’s furnishings, as well as Agnes’ dress, makes us think that time has stood still here.) During the party, she passes food, cleans up a broken plate, arranges candles on a cake she clearly made herself — and only then, during the singing of “Happy Birthday,” do we learn that it’s actually her own birthday. The movie’s barely three minutes old and we already know everything about Agnes; perhaps more than she knows about herself. We’ve all seen many movies like “Puzzle,” in which a quiet person discovers something at which she or he excels, and in the process emerges from a shell, blinking at the now-bigger world. For Agnes, that something is jigsaw puzzles: After receiving one for a birthday gift, she finds that she’s brilliantly quick at assembling them. Unbeknownst to her well-meaning but clueless husband (David Denman) and late-teens sons (Bubba Weiler, Austin Abrams), she begins a series of secret trips to Manhattan; meeting up with a “puzzle partner” named Robert (Irrfan Khan) with whom she plans to enter the national championship. (Yes, competitive jigsaw puzzling is a thing.) Their meetings are initially awkward — “I’m not comfortable, generally,” she tells Robert — but he recognizes her skill. You watch this movie knowing exactly what’s going to happen: that Agnes’ lies about her whereabouts are going to catch up with her; that Agnes and Robert will develop a closeness that complicates her life; that puzzling will, ultimately, give Agnes the confidence to make bold decisions; and that puzzling will provide a series of almost-but-not-quite-heavy-handed metaphors for life. (“When you complete a puzzle,” says Robert, “you know you have made all the right choices.”) But director Marc Turtletaub does lovely work with the actors — particularly Macdonald, who gives Agnes a tremulous glow that develops throughout the film into a tiny beacon — and “Puzzle” becomes a low-key pleasure, with all its pieces fitting together nicely. 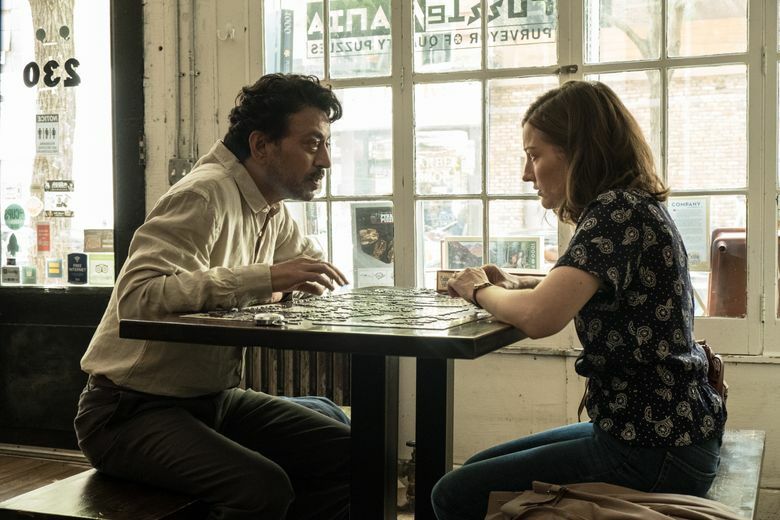 ★★★“Puzzle,” with Kelly Macdonald, Irrfan Khan, David Denman, Bubba Weiler, Austin Abrams. Directed by Marc Turtletaub, from a screenplay by Oren Moverman and Polly Mann, based on the film “Rompecabezas” by Natalia Smirnoff. 103 minutes. Rated R for language. SIFF Cinema Uptown.